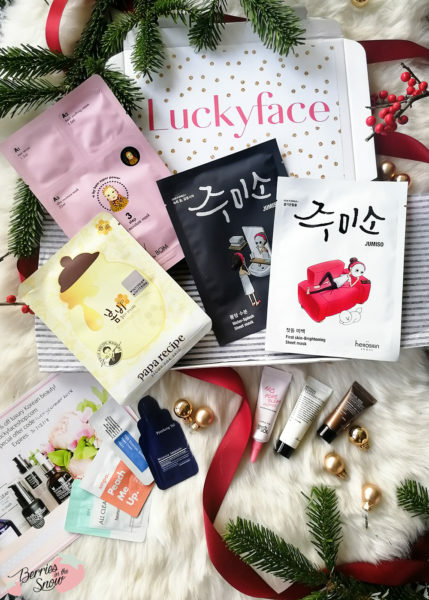 The Korean Beauty Starter Kit includes 4 Korean face sheet masks and 7 KBeauty samples, perfect to dive into your Kbeauty journey. The Helloskin First skin Brightening Sheet Mask is directed towards brightening using vitamin A and E. It is made from cupra cotton and holds in up to 10x more essence on your skin. Key ingredients include Gigawhite for smoothings and brightening and Ceramide complex for firming and plumping up the skin. The Helloskin Water Splash Face Mask gives dry and tired skin a boost of moisture. As the other mask from this brand above, it is made from cupra cotton and holds in up to 10x more essence on your skin. The key ingredients include shea butter and hyaluronate complex for nourishing and hydrating the skin. I just started to use my first A by Bom products and recently reviewed their Ultra Time Return Eye cream. This sheet mask here comes with a compartment containing eye serum, fresh soothing cream, and the ultra moisture mask. I love combination masks like this especially for traveling, so you don’t need a lot of separate products. 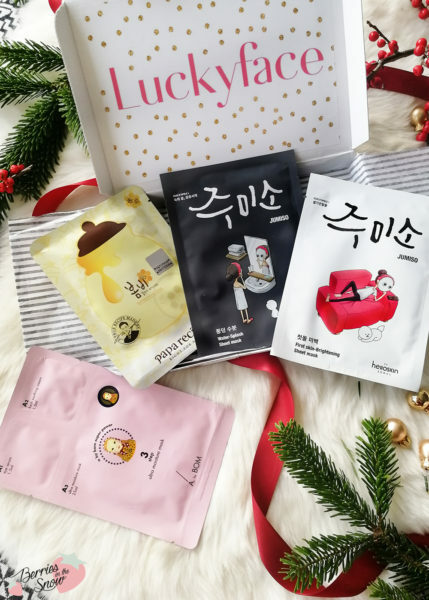 Last but not least, the Papa Recipe Bombee Honey Mask is one of these masks that has been hyped by many KBeauty lovers. A very nourishing mask with a honey/propolis complex, that has a nice smell, too. I have used and love this mask before. A thick and rich cream containing snail mucus and bee venom. Many people love this cream and it has been reformulated since the last time I used it. Back in the past, my skin didn’t like the products from this line, unfortunately. I have reviewed this cleanser in the past and I remember that I liked it a lot, because it didn’t make my skin feel dry after using it. Read my review >>here<<. This primer seems to be very popular, too. It has a unique formula that controls sebum, banishing shine! Key ingredients include green tea extract providing soothing antioxidant benefits, and collagen boosting smooth and healthy skin. The Pyunkang Yul Mist Toner is great for refreshing and hydrating tired skin. Its key ingredient is Coptis japonica root extract which is a powerful antioxidant which nourishes the skin and reduces any inflammations. I have heard very positive opinions about the brand so far. The COSRX Moisture Renewal Power Cream is great for softening and moisturizing your skin. It’s a gentle chemical exfoliator (3% PHA) that reduces moisture loss but also contains coconut extract that promotes hydration. I have the full-sized jar in use and love the glowing effect that it delivers to my skin the next morning. Moisturizes and brightens the appearance of skin while maintaining tone. This brand is new to me but I like the fact that it contains 71% Real Peach Essence as a key ingredient. This cleaning gel helps to balance out the skin’s pH level while removing impurities. Witch hazel and Centella Asiatica are some noteworthy ingredients. 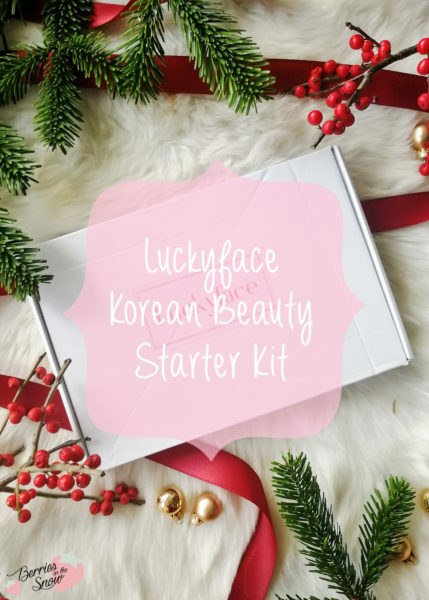 All in all, the Luckyface Korean Beauty Starter Kit even contains some new brands for me, although I have been using KBeauty in the past years. 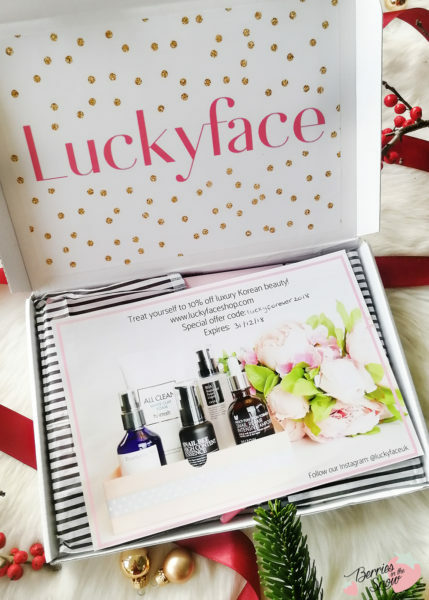 I love the concept of creating a box specially designed for KBeauty newbies. The box retails for 20£ and can be shipped to customers in the UK. You can also get it from UOpen >>here<<. Luckyface also offers a subscription service for people more familiar with Kbeuaty called The KBeauty Glass Skin Box. This box retails for 30£ and will be delivered to your doorstep every month. You can check out both boxes >>here<<. Just as a short reminder: All products mentioned and reviewed on this blog are of my personal opinions. 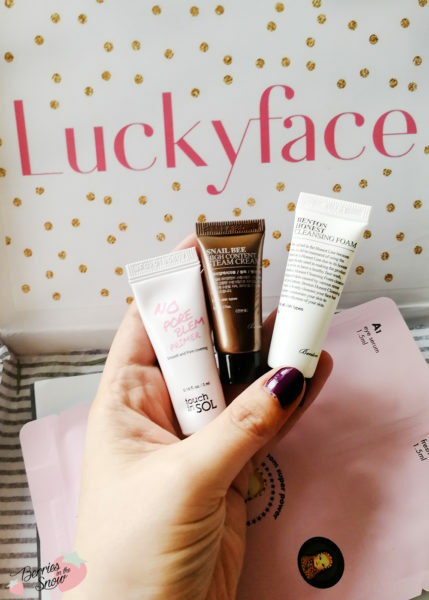 This product here was sent to me for reviewing purpose by https://luckyfaceshop.com/ which doesn’t influence me in providing my honest opinion on the products. The HELLOSKIN Water Splash Sheet Mask sounds very good! That honey mask looks incredible! My dad is a beekeeper so I know the incredible benefits of honey for your skin and health! My fav is P.apa Recipe Bombee Honey Mask . A by BOM sheetmask looks great! ❤️ I’d love to also try Jumiso Mask too! I am excited to try it. 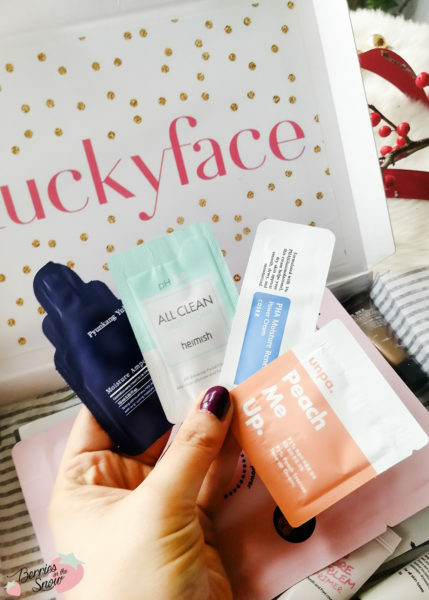 My favorite in the lucky box is HELLOSKIN Water Splash Sheet Mask as a sheet mask . By the way your blog is so lovely. It’s remind me to update my blog too. Haha.. I am join your giveaway in IG. I would love to try their products! I loooove korean products!